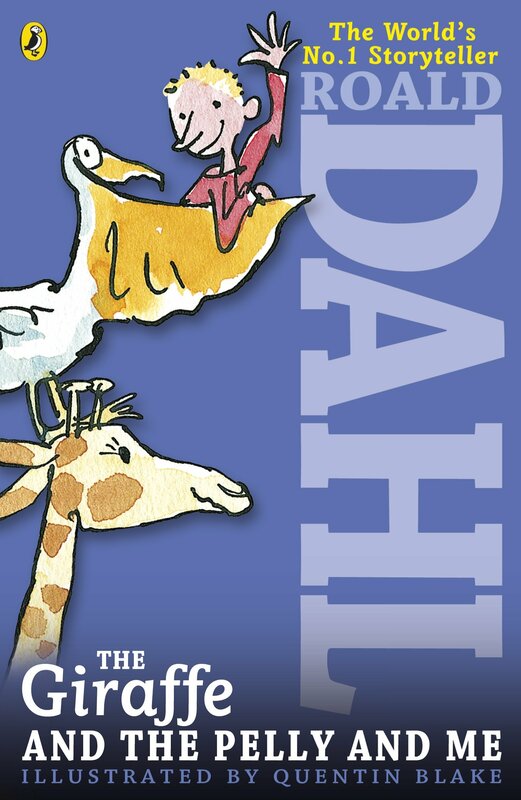 The Giraffe And The Pelly And Me by Roald Dahl (Yes, the Charlie and the Chocolate Factory Roald Dahl) is a hilarious and short book about a Giraffe, a Pelican, a Monkey, The Duke of Hampshire, and a young boy named Billy, the narrator of this story. Billy dreams of owning a marvelous sweet-shop. There is an old building by his house called "The Grubber", with the words FOR SAIL on the window. (In the old days, a grubber was a name for a sweet-shop.) Billy wants to turn it back into a wonderful sweet-shop again. One day, Billy sees that the words FOR SAIL have been scraped away and in its place someone has painted SOLED. Then pieces of the inside of the building start flying out the window, as if someone were inside the building, ripping things apart and chucking them out. Suddenly, a strange head appears out of a window on the top floor. Billy had no idea who or what it belonged to, at first. Then another window opened and a Pelican landed on the windowsill! The Pelican ("the Pelly") introduces Billy to the Giraffe, the owner of the head he saw. Then, on the first floor, another window flings open and a monkey pops out! They are the window cleaners, and each of them can do a special thing. Pelican can retract the top of his beak and turn his lower beak into a huge bucket (for water) without his top beak getting in the way. See the picture above! Giraffe can stretch her neck to an amazing height (like a ladder), and Monkey can climb up her neck (like climbing a tree) to wash windows on the upper floors of a building. Oh, and all three of the animals can talk. After a little chit-chat, the window cleaners receive a letter from The Duke of Hampshire, the richest man in England, asking them to clean all 677 windows of his house. So in a short while, they arrive at the Hampshire House (Billy has to show them the way there.) Billy and the window-cleaners introduce themselves to The Duke of Hampshire. The animals appoint Billy as their official business manager (they don't know any other humans) and they get to work. This book is great for anyone who loves a short, funny story that never gets boring. The book is only around 70 pages, and has loads of illustrations that made the reading even more fun. I hope that everyone who reads this book loves it. And be sure to check out all the other books by Roald Dahl! Daddy's afterthoughts: Some parents may be worried by Dahl's reputation as being antisemitic in his personal views, but I don't know if that should color anyone's consumption of or enjoyment of his works of fiction, and I don't see that it actually affected his writing. (But where parents are making choices for their children, forewarned is forearmed, and trigger warnings are all the rage these days.) All that said, this is a deliriously silly and wonderful book, and I just recently learned that there is an audiobook out there voiced by none other then Hugh Laurie (of House fame)!!! Hear a snippet here. Thanks, I'll look at them! Thanks for the suggestion, this was a great read. Awesome blog, Julia! I loved Roald Dahl and Shel Silverstein when I was your age. Do you like Tamora Pierce? Also I love the photo of the baby reading a book. I don't know Tamora Pierce, but I looked up one of her books (Alanna) and it looks interesting. The baby is me (my dad chose the picture). Just a tip: You should change the colour of your blog's text from red to black. Red text on a white background is hard to read. My dad agreed with you. I have The Secret Garden, and I've heard of Hatchet... My dad says he'll definitely buy me A Wrinkle in Time! Great review! And thank you for the thoughtful afterthoughts daddy. I enjoy Dahl's writing very much. I think my favorite book of his is Matilda. She's such a great character and the story is so much fun! As your reading is quite rich and cultured, I have a recommendation. "The One and Only Ivan" by Katherine Applegate is one of the best books I have ever read. Our whole family was completely transfixed by the story. Awesome blog, Julia! I loved this book when I was younger. Your review was spot on. Keep doing what you're doing!